Over a year ago, the 2018 YZ450F arrived with fireworks and celebration. It had a new engine, a new chassis and virtually every part was redesigned. But that wasn’t what got everyone’s attention. It was the first production motocross bike that could be tuned without being touched. You didn’t have to open a toolbox, hold a wrench or even plug in a computer to completely alter the way the bike ran. Now, the 2019 version of the bike has arrived with very few apparent change. Yamaha is still giving us time to wrap our heads around the new world. Yamaha always believed in the coil-spring fork and influenced an entire industry to do an about-face. It would be somewhat disrespectful to dismiss the amazing work of Yamaha’s mechanical engineering staff on the YZ450F that was presented last year. It had a completely new electric-start motor. Yamaha, of course, already had an electric-start version of the old YZ450F motor. It was the one that was used in the YZ450FX and WR450F off-road bikes. It would have been easy to simply use that, but the engineers had the budget and the time to start from scratch, so that’s what they did. Only the reverse head layout was kept, so the exhaust was still in the rear. The new design was 2 degrees more upright, which meant that it was almost straight up and down. Interesting, because so is the new Kawasaki’s, but it still has the exhaust up front. Yamaha had more aggressive cams, a lighter piston and more compression. One of the most surprising changes at the time was the switch to Mikuni for the throttle body and EFI system. Yamaha already had a relationship with Mikuni for the EFI systems on the YFZ450 quad, so it wasn’t as big a leap as it seemed. Crank inertia was decreased and the generator was rewired for less output. It turned out that the older generator was overkill, and that resulted in an electromagnetically induced drag on the motor. Several gears were wider and the clutch was redesigned. This year Yamaha made very few changes to the YZ. That’s okay, because last year there were plenty, and we’re still getting used to some. By keeping the reverse cylinder, the intake and airbox remained up front. That was a boon for the battery placement, which is under the seat. Usually, engineers struggle to prevent the battery box from hampering airflow into the filter, but in the case of the YZ, the filter is on the other end of the bike. The new chassis got more rigid, narrower and lighter, and the rider compartment was changed extensively, with a steering head that was farther forward, taller bars and a lower seat. All that was wrapped in new bodywork. Needless to point out, Yamaha stuck with the KYB coil-spring fork that everyone loved. 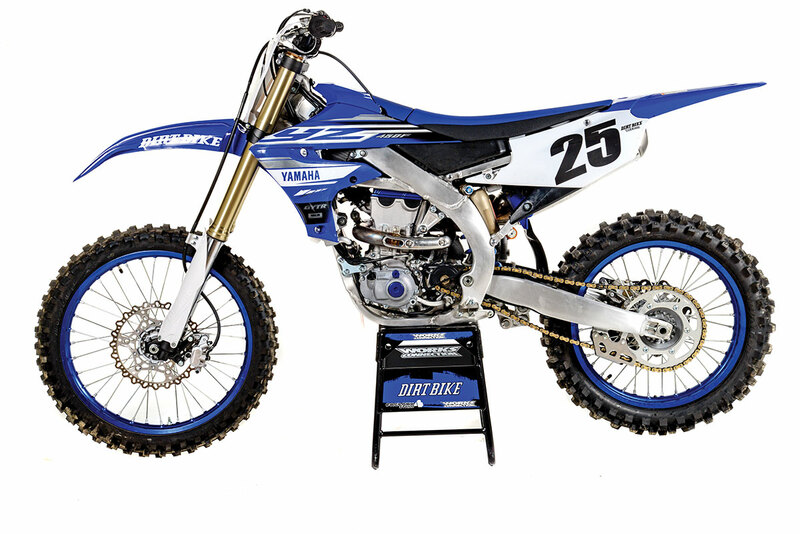 It seems that Yamaha single-handedly brought the entire Japanese motocross industry back to coil springs in front. That brings us to the 2019 model, which is pretty much the same bike. Yamaha gave the front end more rigidity by increasing the mating surface between the front-wheel spacers and the fork. The suspension was stiffened slightly, the seat foam was made denser in the area directly under the rider and the rear sprocket went from a 48-toother to a 49. Yamaha still has good brakes, although they don’t have the sheer power of Brembos or the new Kawasakis. The real breakthrough in tech is the Yamaha Power Tuner app. It’s still available for iPhone and Android smartphones. You download it (for free) and then connect with the bike, which is broadcasting its own Wi-Fi signal. If you’ve ever used the old plug-in Yamaha Power Tuner, you’ll recognize the interface. It allows you to add or subtract fuel in 16 different zones, as defined by a combination of throttle opening and rpm. Same for ignition advance. Nothing about the app has changed, but we do have more experience with it now that we’re a year down the road. 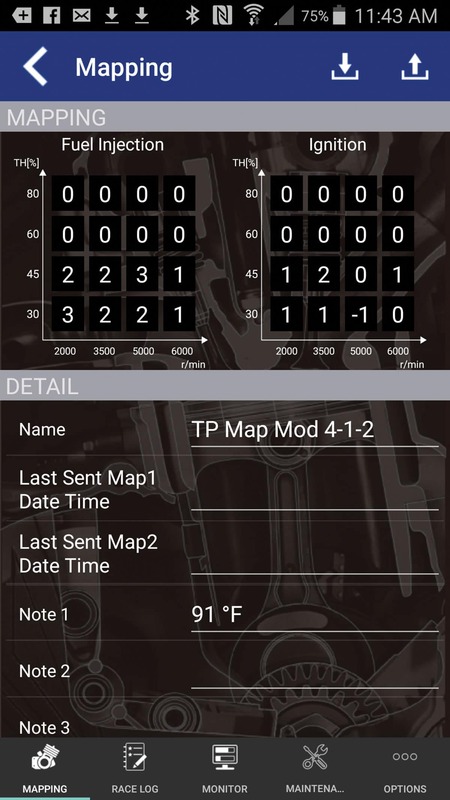 It is a truly amazing tool that lets you do stuff that was impossible with carbureted bikes. We have to admit, though, that we’re disappointed with the public reaction to the app. After a year, we figured there would be an on-going internet buzz of riders sharing maps and information. Aside from a few threads here and there, it hasn’t happened. Part of the issue is that most riders ride for fun and don’t want to make it into work. The ease of tuning makes testing more tedious. Changing the needle on a 2008 Yamaha YZ450F with a Keihin carb was so difficult that you could only try three or four settings in a given day. In the same amount of time, you can try 20 settings with the Power Tuner app, and we’ve found that riders and tuners quickly get lost in the jungle trying to find the magic mixture. Most riders simply don’t have the physical and mental stamina to test accurately, lap after lap after lap. In the end, you can try three or four settings before the rider loses his ability to be discerning. That’s not a criticism of the technology—just the opposite. It’s an indictment of the human element. After a full year of trying different maps, we have returned to the map that was our favorite on the first day of testing one year ago. We call it the “Preston map,” because it was Travis Preston who suffered through the endless laps of testing to develop it. Yamaha’s Power Tuner app is amazing technology. This is the Preston map, which remains our favorite. Whether it has the Preston map or the standard one, the 2019 YZ450F is a rocket, just like it was last year. It has massive low-end power and tongue-swallowing top-end. It might or might not be the most powerful motocross bike in the world. We don’t really know or care. Last year it held that honor, but this year the Honda, Kawasaki, KTM and Husqvarna 450s all have had enough changes to potentially dethrone the YZ. This is a matter for dynamometers and technicians in white lab coats to debate. 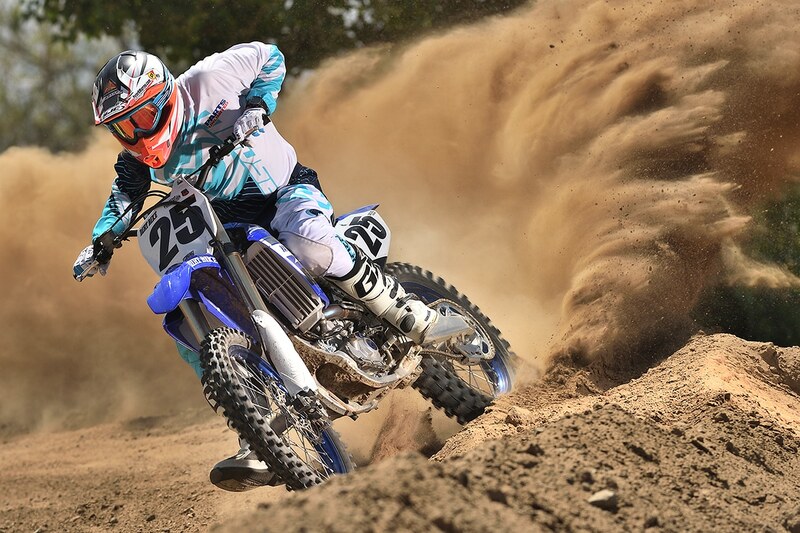 As far as the average rider is concerned, the YZ has all the power you could ever need. There are very few opportunities to hold the throttle wide open as it is. Of all the new-age 450s with superpowers like this, the Yamaha is the one that feels like something even larger than a 450. It doesn’t rev quite as quickly as the Honda or the new Kawasaki, and it has the most linear progression of power. The Preston map is actually a little more aggressive. It gives the bike a sharp little zap in the middle. You wouldn’t think this would work on a bike so powerful, but as it turns out, most of us use that snap in order to break the wheel loose for a turn or launch off a big jump. 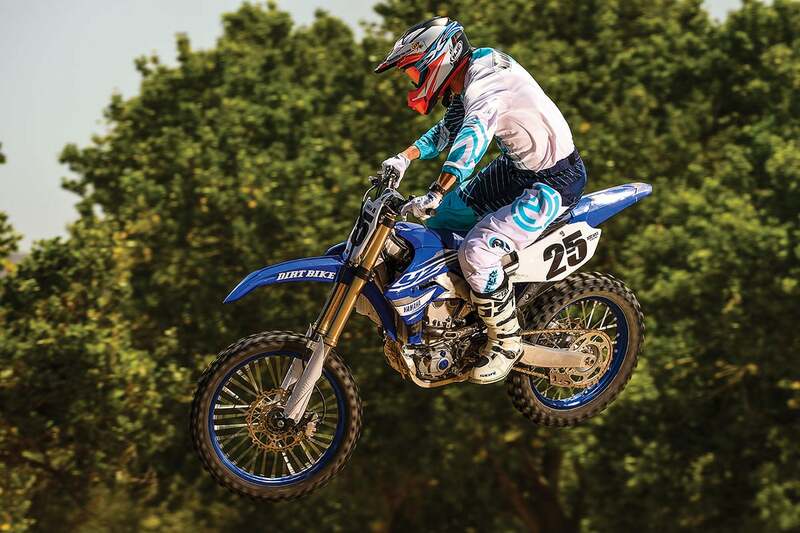 In the motocross world, the broad topic of Yamaha 450 handling is more divisive than anything. Everyone acknowledges that there’s something a little different going on, but there’s no consensus beyond that. Is it good or bad? Is it the front end? Is it the rear? We have long-time staff test riders who think the Yamaha is the best-handling motorcycle ever built. We have others who refuse to ride it. To break down fact from myth, there are several matters to consider. The biggest is riding technique. 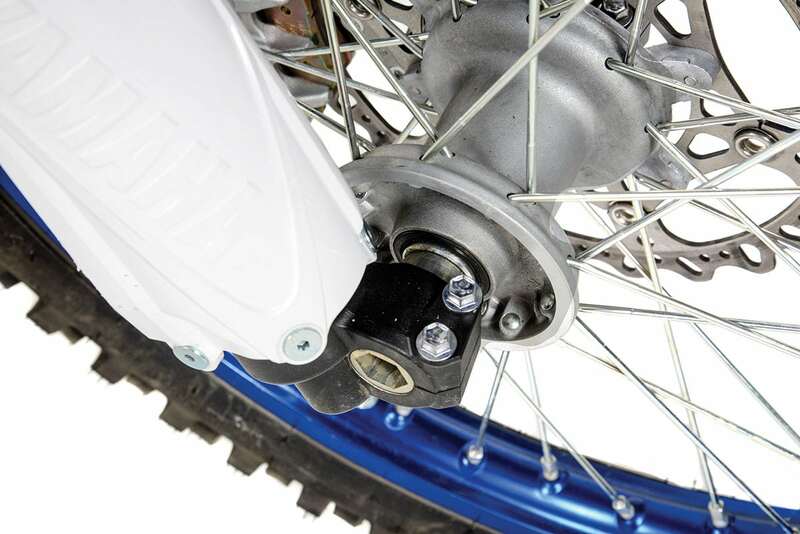 We’ve found that riders who load the front wheel heavily entering a turn generally don’t like the YZ’s feedback. Others, who back it in like a flat-tracker, have no trouble. There’s another contingent of riders who simply think the Yamaha feels big and heavy. Make no mistake—the Yamaha is heavy. It tips the Dirt Bike Super-Scale at 239 pounds without fuel. That’s 14 pounds heavier than the 2018 KTM 450SX-F. But, it’s about the same as the Honda CRF450R and the Suzuki RMZ450, which are generally praised for their cornering ability. 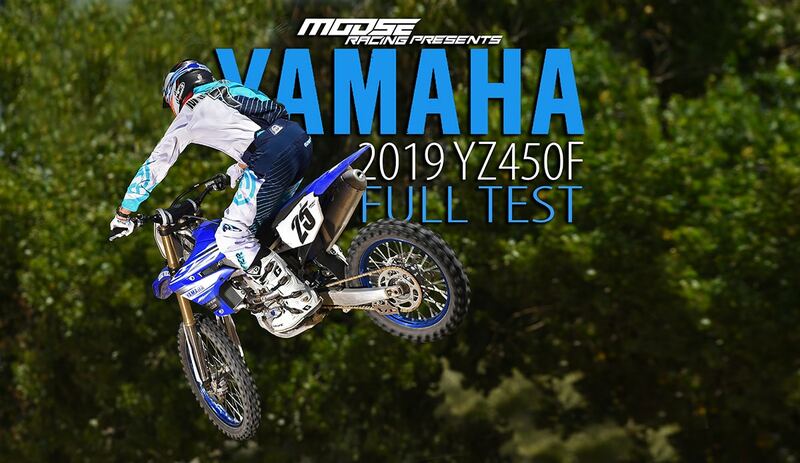 For a Dirt Bike Magazine video featuring the 2019 Yamaha YZ450F, click the image above. At least there’s no debate about the Yamaha’s suspension. It’s incredible. By sticking to its guns with the KYB SSS coil-spring fork while the rest of the industry went bonkers for air forks, Yamaha came out on top. The suspension is still excellent, especially in front. Coil springs are certainly worth a couple of pounds of extra weight. This year, Yamaha stiffened things up a little. We don’t know what the motivation was; we already thought it was a little stiff. But, it doesn’t amount to anything more than a different clicker setting. We set the fork compression to 12 (8 is stock) clicks and increased rebound damping by a click. In the rear, most of our riders liked it with more than the recommended 100mm of sag. Most of our test riders still don’t like the ergos of the new Yamaha. The stock handlebar position is a little too high and the seat is a little low, forcing the rider to shift his weight too far rearward. We ran a taller seat with shorter bar pedestals last year. Is the 2019 Yamaha YZ450F the most powerful bike in the motocross kingdom? We don’t know or care. It’s fast enough for any sane rider. This motor hasn’t been around long enough for us to know if it’s as reliable as the old one. It probably is. There are a zillion of the old five-valve Yamahas still riding around on their original pistons. Yamaha’s test department claims that they could have the lightest bike in the class if they would relax their reliability standards. They won’t do it. We believe them. From our experience with the 2018 model, we know that the clutch is the most reliable of any Japanese bike. We can say that if all cable clutches were this good, hydraulic clutches would never have been invented. Whether the Yamaha will go down in history for its mechanical reliability or its digital inventiveness doesn’t matter. It remains one of the most significant motocross bikes of our time for a variety of reasons, and for many riders, it’s the best bike in the class. All good bikes can influence the races they enter today. 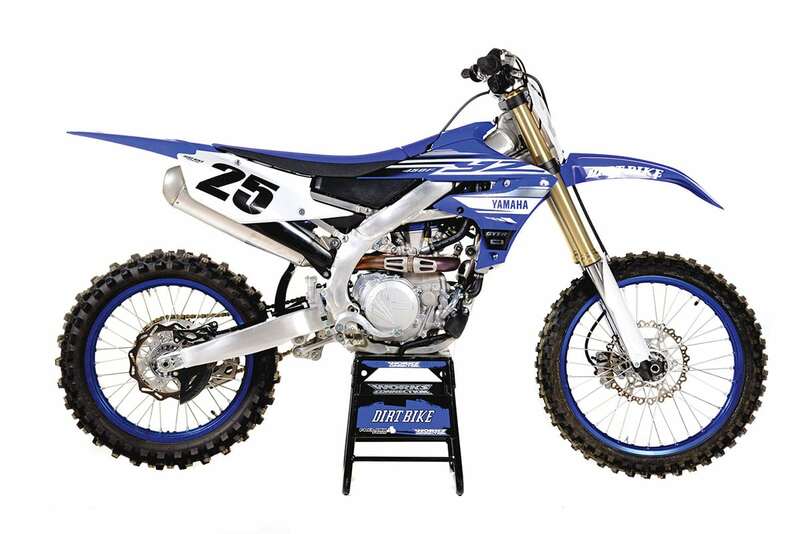 Great bikes like the YZ450F influence the motorcycles they race against in the future.